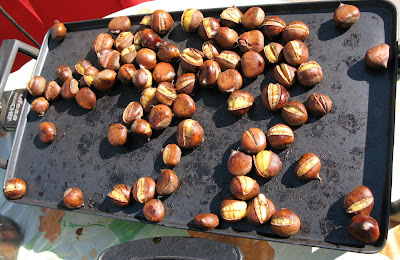 In autumn I always buy roasted chestnuts on the street, but I bake only rarely at home, although the recipe is very simple. 1. Heat the oven to 200Celsius or Gas 6. 2. Cut a cross into the top of each nut into the top of the flesh. Put in a roasting tin and bake until the skins open and the insides are tender about 30 minutes. 3. Peel away the skin and eat. Cabbage Festival in Vecsés, 23. 09. 2007.